Theatre Space complete with retractable seating, performance area and lighting. 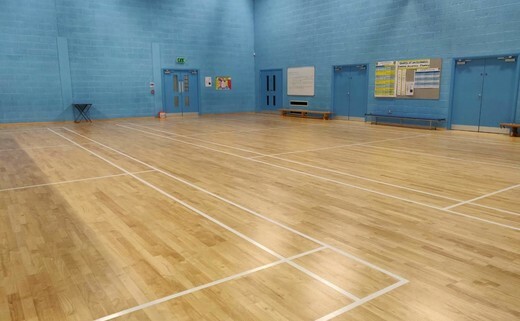 It can also be used as an open space, the perfect venue for exercise classes, dance, drama, music and a whole host of other events and activities. Astro Turf available to hire as a full pitch or in thirds. Suitable for groups and clubs of all sizes. The perfect facility for 5-a-side football, rugby, hockey and many more sports and activities. A superb traditional indoor sports facility, perfect for 5-a-side football, badminton, cricket and many more sports and activities. This can also be a great venue for parties, celebrations and events. A superb indoor training facility, perfect facility for 5-a-side football, badminton, cricket and many more sports and activities. Available for parties, celebrations and events. 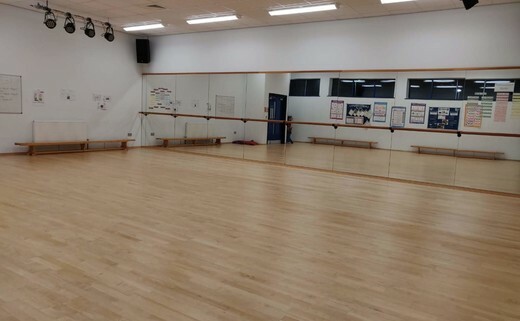 Air conditioned Dance Studio with mirrors and bars, available to hire. A great venue for regular dance groups, fitness classes and much more. Make this space your club or group’s new home. Casual or one off bookings also welcome. Open space suitable for practice or group activity. An ideal space for drama rehearsal, dance and more. This provides a great learning environment perfect for your drama groups and performing arts classes. The new caged Multi Use Games Area is available for hire. Suitable for weekly or casual/one off bookings. This is not a floodlit facility. Make this space your club or groups new venue, or host a great outdoor event. Tarmac Area available for hire. Suitable for weekly or casual/one off bookings. This is not a floodlit facility. Make this space your club or groups new venue, or host a great outdoor event.